other directories, files, free blocks, etc. Figure 1. Components of a QNX 4 filesystem in a disk partition. These structures are created when you initialize the filesystem with the dinit utility. The first physical block of a disk partition is the loader block. 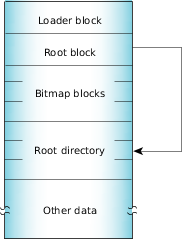 The root directory follows the bitmap blocks.